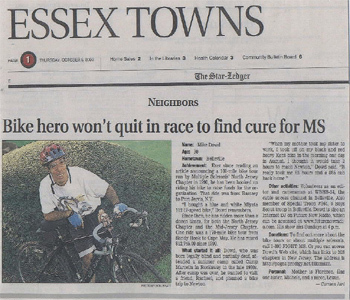 * * * I have permission from the "Star Ledger" (color) newspaper to copy this article onto my page. The article you are about to read is from October 5, 2000 by Carmen Juri and photo done by Ron Wyatt in "Neighbors." It is in the Essex Towns section. * * * Click the image to see the full size JPG file. The file size is 224kb and it is compressed to 90%. The JPG image is 100dpi.